Introducing the revolutionize designed jigging rod combining V9 development concept and 98% Japan high modulus graphite blank with super thick inner wall to handle any kind of game fish with ease. 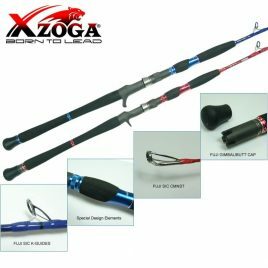 The toughest and powerful rod that you ever imagined, perfectly tuned Power Transmission Fighting (PTF) action enhances the lifting power and handling feel while minimizing the fatigue exhaustion of the angler. Equipped with 100% Japan FUJI components, stunning customize aluminum custom parts with triple layer crack proof HMR coating blank surface. Featuring SS concept design, light, strong, sensitive responsive, Taka-SS CS no doubt is your ultimate dreams weapon.